When the transplant nurse called me yesterday afternoon to give me the results of Addison’s kidney function test (the GFR) from last week, she hastily said, “But it doesn’t mean anything.” So what does that mean? Addison’s GFR is 67. Normal for adults is 100. You don’t need to do any fancy calculations to know a 67 can’t be good. A GFR of 60-89 is actually considered stage 2 chronic kidney disease…at least in adults. And that is the underlying problem. Apparently there is no good benchmark of “normal” for babies under age 2, let alone babies under the age of 2 who have had heart transplants. Which may lead you to my next logical conclusion – why bother doing it in the first place?? Hence a great example of why sometimes too much information is not a good thing for moms who fret too much. The plan is to lower Addison’s Tacrolimus dose. Now that we know there is no rejection of her transplanted heart, our cardiologist is comfortable going down on the target Tac levels. The princess has always liked to keep things interesting so she was getting a huge dose (even bigger than most adult transplant patients) of this potent anti-rejection drug with very minimal amounts actually showing up in her blood levels (click HERE and HERE for previous posts on the Tac dance). We will go for more blood work in a couple of weeks and see if her kidney function numbers improve at all. Tac is tough on kidneys and renal function impairment is a well known risk factor. But really, what is the choice? Well, nothing like a little fun for distraction from all this serious stuff. 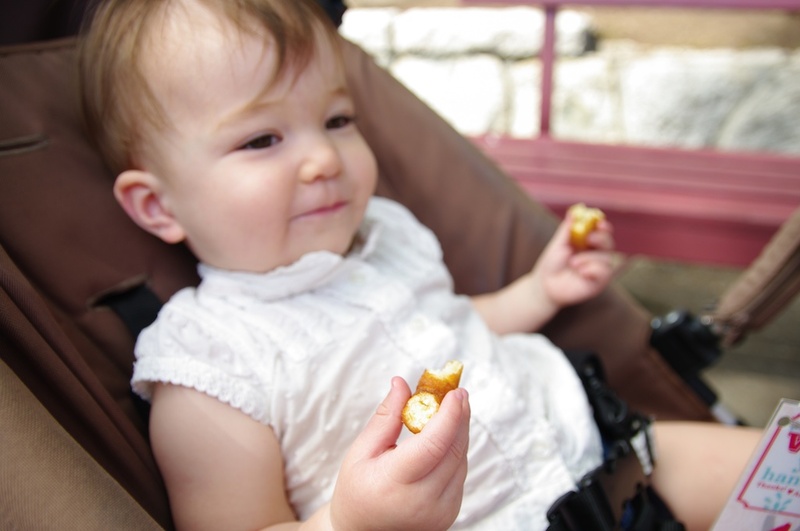 We took Addison to the PNE for the first time. She thoroughly enjoyed people watching, the farm animals, the mini donuts and the giant smoked turkey leg Mommy and Daddy thought would be a hilarious photo op. Though she chowed down quite heartily on the turkey, we will endeavour to stay away from salty smoked meat in the future…definitely not kidney-friendly food! First off, How did you keep the sauces etc on the turkey leg and not Addison ??? Hang in there you guys, you have come a long ways and your little girl is obviously a fighter. As Cheryl stated , keep making memories. Well, whatever the “results”, if the “experts” say “It doesn’t really matter”, then don’t worry!!!! Just look at her – she is so happy and just loving life (and turkey legs!) Did she get to eat the ENTIRE leg herself?????? That is one lucky girl!! AND donuts???? Man – she is quite the little princess! 🙂 Did she go on any rides?? ?